A mystery is brewing on Mars: Amateur astronomers spotted enormous plumes erupting off the Red Planet's surface, leaving scientists puzzled. More than 155 miles (250 kilometers) high and hundreds of miles across, the baffling plumes were spotted by amateur astronomers in the spring of 2012. The plumes reflect sunlight, which means they could be made of water ice, carbon dioxide ice or dust. But clouds made of those materials would be hard to explain with current models of the Martian atmosphere, scientists say. Scientists at the Universidad del Pais Vasco in Spain studied the images of the plumes and confirmed that they reach heights of more than 155 miles (250 km) above the surface, and cover an area of up to 310 by 620 miles (500 by 1,000 km). Caption: An image captured by amateur astronomer W. Jaeschke in 2012 revealed a mysterious plumelike feature (marked with yellow arrow) at the limb of the Red Planet. The image is shown with the North Pole toward the bottom and the South Pole to the top. "At about 250 km, the division between the atmosphere and outer space is very thin, so the reported plumes are extremely unexpected," says Agustín Sánchez-Lavega of the Universidad del País Vasco, lead author of the new research. The features developed in less than 10 hours and remained visible for about 10 days, but changed their structure from day to day, ESA officials wrote in a statement. None of the spacecraft orbiting Mars were in a position to see the plumes, due to their locations around the planet and light conditions at the time. Analysis of the images from 2012 and of past images of plumes erupting from the surface of Mars haven't helped the researchers determine what caused the plumes or what they are made of. "One idea we've discussed is that the features are caused by a reflective cloud of water-ice, carbon dioxide-ice or dust particles, but this would require exceptional deviations from standard atmospheric circulation models to explain cloud formations at such high altitudes," Sánchez-Lavega said in a statement. It's possible the plumes are somehow caused by Martian auroras, according to the authors of the new research. These brilliant light displays are known on Earth as the northern and southern lights, and are caused by the interaction of high- energy particles and a planet's magnetic field. 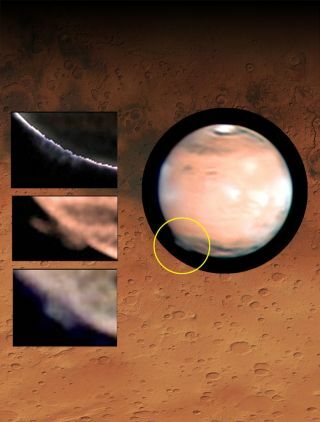 A plumelike feature was observed on Mars on May 17, 1997, by the Hubble Space Telescope. It is similar to the features detected by amateur astronomers in 2012, although it appeared in a different location. "Another idea is that they are related to an auroral emission, and indeed auroras have been previously observed at these locations, linked to a known region on the surface where there is a large anomaly in the crustal magnetic field," Antonio Garcia Muñoz, a research fellow at ESA's ESTEC and co-author of the study, said in a statement. The ESA statement reports that "further insights should be possible following the arrival of ESA's ExoMars Trace Gas Orbiter at the Red Planet, scheduled for launch in 2016." The new results were reported in yesterday's (Feb. 16) issue of the journal Nature.